«©NCSX» After the spate of R2-D2 products from the past year such as the Soy Sauce Bottle, the Laundry Basket and the Pepper Mills, we assumed that the next Japanese Star Wars product would again be a houseware item of some stripe. 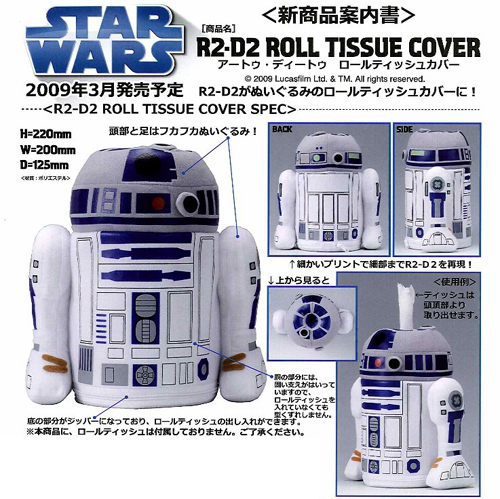 Japanese manufacturer Ensky ships a plush R2-D2 Roll Tissue Cover which measures H22 x W20 x D12.50cm (H8.66 x W7.87 x 4.92") in dimension. The height of the cover isn't tall enough to accommodate a roll of Bounty paper towels which measures 11" tall but maybe if it's sheared by roughly 3" off the top, we can shove it into the R2 Tissue Cover. You could be like everyone else and buy a boxy USB hub that was designed by an engineer. A by-the-book engineer who wears a polyvinyl pocket protector that holds exactly five Energel 0.5mm ballpoint pens.